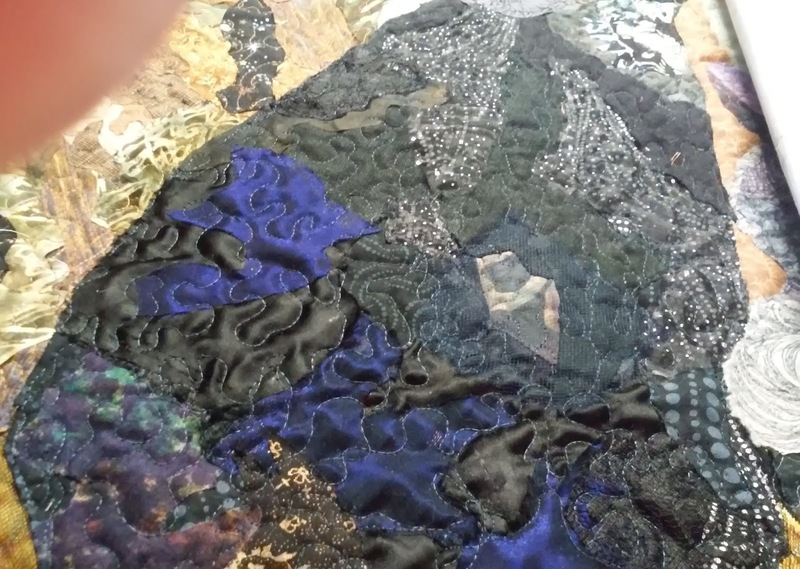 My most recent obsession is fabric collage using Susan Carlson's technique of laying on a multitude of fabric bits to create a piece. 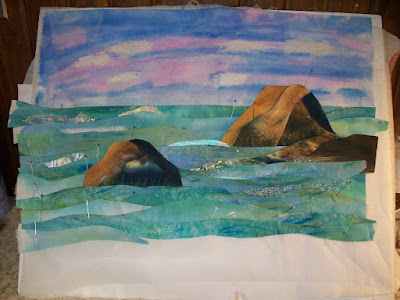 Think of a painter dipping a brush into paint and applying it to canvas, whereas in fabric collage I cut a bit of just the right piece of fabric and lay it on the background. Having a huge fabric inventory is essential, because there isn't the option of mixing paint to get the right color. You have to search through you fabrics--which is a fun activity in itself! 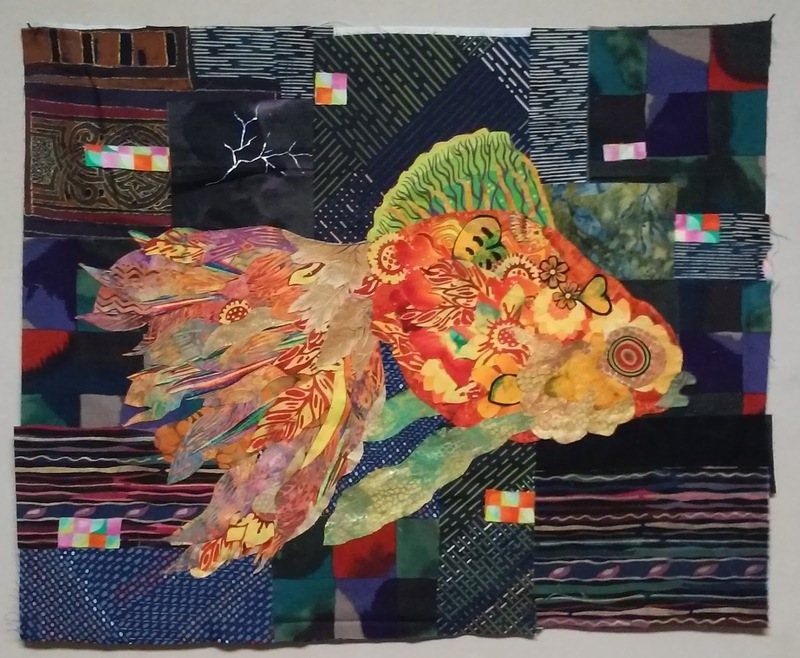 I have completed The Window Watchers; Green Carp is complete except for quilting and edge finishing, which will not alter the look much. In Green Carp, paper is laid on to show where the edges will be when finished. 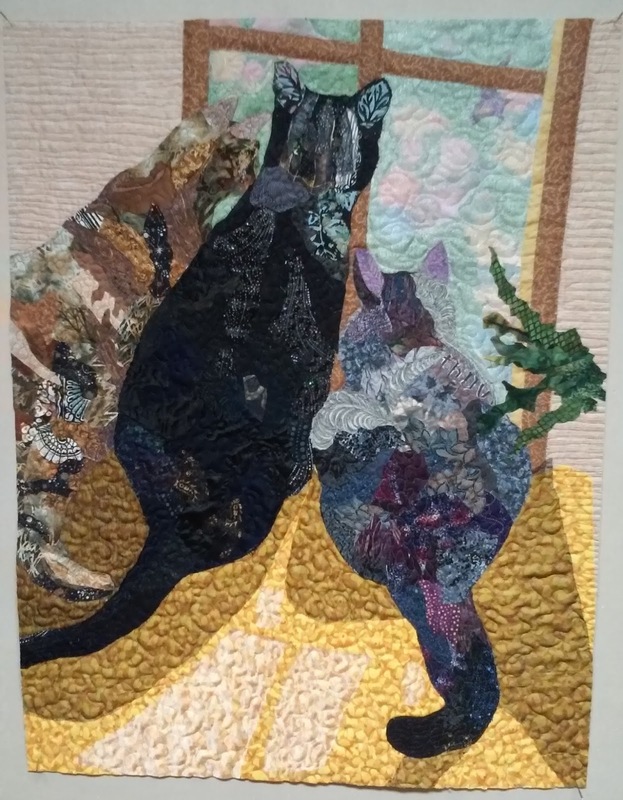 The Window Watchers, 22" x 28"
Green Carp top before quilting, 24" x 18"
I have done fabric collage for many years in a more simplified way. Here are a few earlier pieces from 2006-2013. Red Hibiscus is a Lorraine Covington pattern (called Pink Hibiscus); all other designs are mine. Campfire, 2006, 22" x 23"
I located an in-progress picture of Pacific Coast from 2006 and can recall that I constructed it on a background by cutting bits of fabric and building the scene. The sky was a white piece which I painted. Water began as white with paint, then cutting strips. 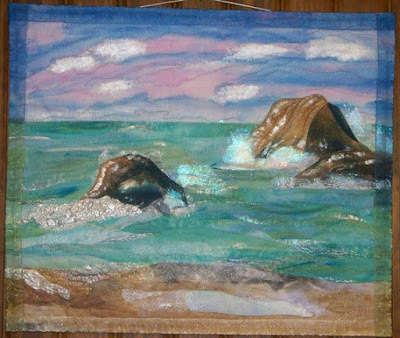 Angelina fibers and painted, crinkled cellophane simulate frothy water. 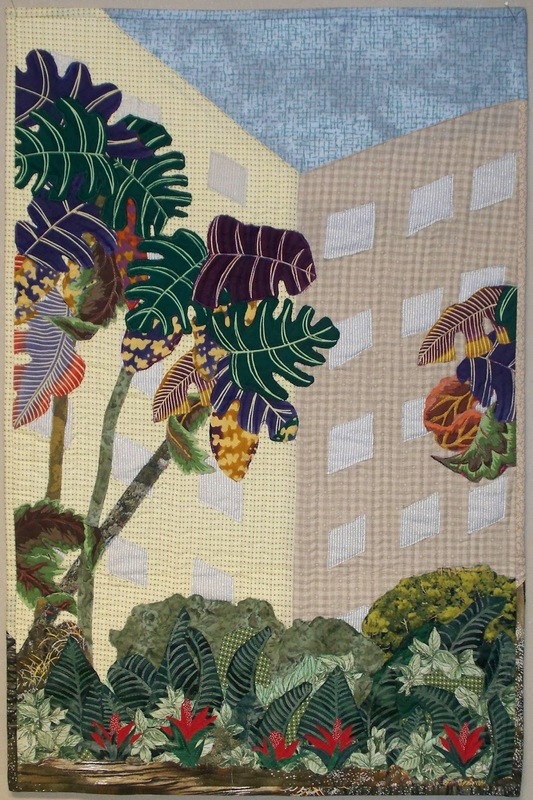 Pacific Coast, 2009, 18" x 15"
In The Atrium at Ochsner's, large sections were used for the buildings, with leaves depicting the tall palm trees in the atrium. Smaller pieces were cut for the foliage on the floor, but still in larger, representational cuts for the objects. 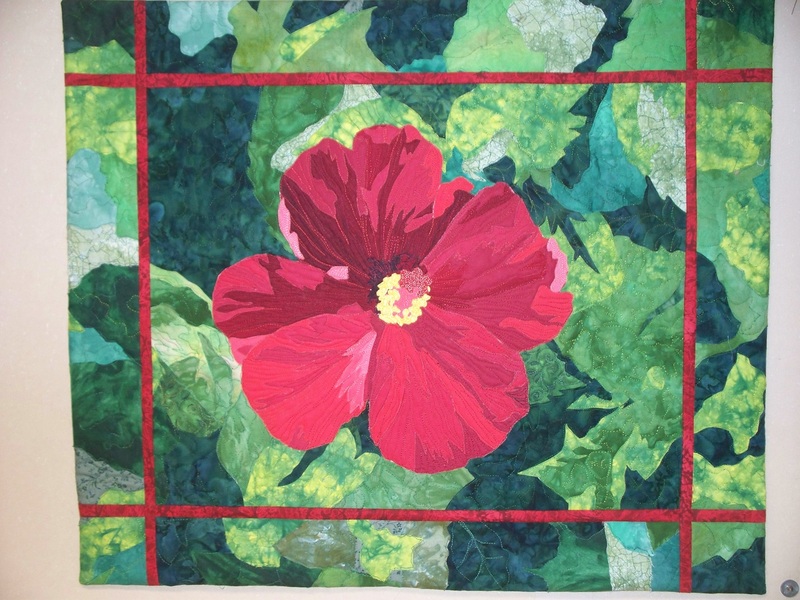 The Atrium at Ochsner's, 2012, 19" x 29"
Red Hibiscus, 2012, 29" x 24"
In When Worlds Collide, the circles and donuts were applied over a pieced background, with addition of organza, feathery ribbon, and beads. 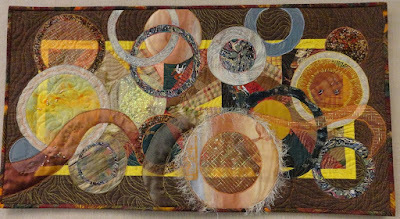 When Worlds Collide, 2013, 34" x 18"
This fabric collage is exciting and enjoyable . . . and addicting! It's not quick, but when you are enjoying what you do, it doesn't matter what time it takes. Well, maybe a little more discipline here would be a good thing. 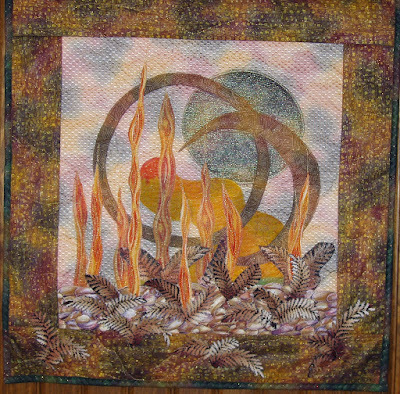 The Yellow Carp (by Susan Carlson's Carpe Carpem pattern) is finished and ready to quilt, trim, and finish the edges. The background was as challenging as the fish body, mainly because there were so many options about how I wanted to do it. 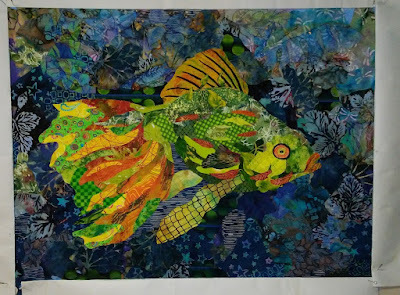 I used dark geometric shapes to help highlight the busy and organic nature of the fish body. The backing will only take off a seam allowance all around. 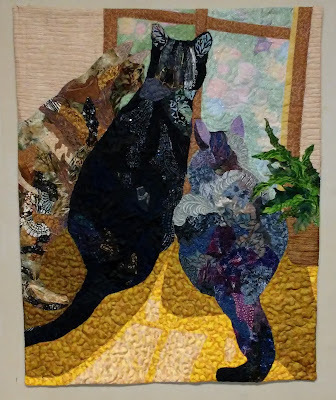 Yellow Carp (yet unnamed), 22" x 18"
The Window Watchers (my three cats looking out an east window) is quilted and ready for facing. They are Rahrah, Tarbaby, and Elizabeth. Elizabeth was featured in an earlier piece, Elizabeth, My Almost Perfect Cat, in some earlier blog posts. Susan Carlson included her in Volume 7 of her Finish Line blog posts. Susan posts finished pieces from her students, and it is an honor to have Elizabeth shown there. The Window Watchers, 23" x 30"
Tarbaby is solid black, and the sun shining on his back gave me the opportunity to use a variety of textures in addition to cotton prints. 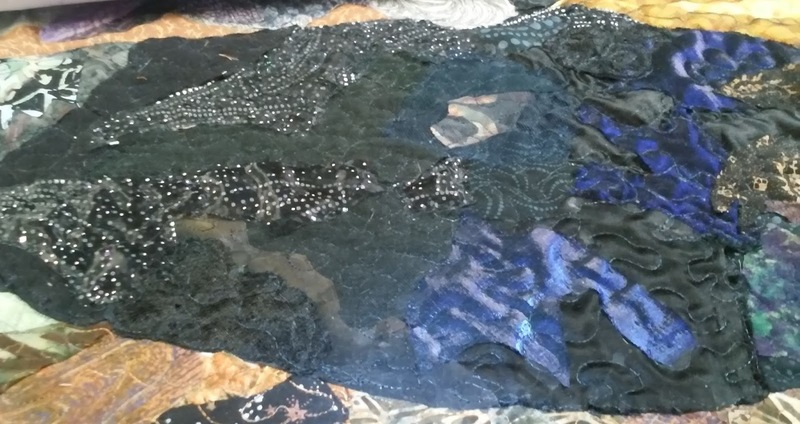 It's hard to photograph organza, and the black flannel and lace don't show in photographs. Detail of blue and black satin and organza. Working at the computer. 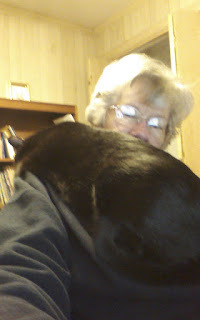 What we put up with to humor our pets! I should have both the carp and the three cats totally finished in the next post. I will also have progress on the Green Carp to show. It's going to be a great 2018! Linking up with Off the Wall Friday.